Weathering will cause these materials to begin to break down. When asbestos-containing materials break, they release asbestos fibers which can lodge in the lungs and cause serious health problems. If you have damaged asbestos roofing materials, let the pros at AQHI Inc. eliminate the health risks through asbestos roof removal in Norwalk CA. 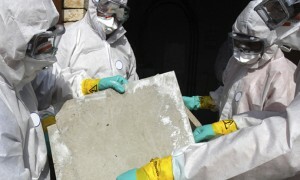 Because we are a dedicated asbestos removal company and not just a general contractor, AQHI Inc. knows how to complete a safe and compliant asbestos roof removal in Norwalk CA. The first step in a roof removal is to make sure any asbestos fibers released during the removal cannot enter the building. We do this by sealing all ducts, vents, drains, etc. We wet the roofing materials and remove them in small sections, which helps minimize fiber release. After the materials have been removed, we clean the area to ensure that your property is ready for your roofing contractor to work on. When you work with AQHI Inc. for your asbestos roof removal in Norwalk CA, waste disposal costs will be included in our bid. We bag all asbestos-containing materials as we work, collect them in a safe location, and cover them with a tarp and appropriate signage until an authorized hazmat disposal contractor can come pick them up. Typically this happens the day after we finish your roof removal. Our asbestos removal office for Asbestos Roof Removal in Norwalk CA is open Monday through Friday between 8:00 AM and 5:00 PM and closed for lunch from noon to 1:00 PM. With advance notice, projects can be scheduled for weekends, early mornings and evenings.